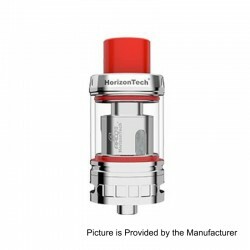 The Original Horizon Arco II Tank is a tank atomizer with 25mm diameter and 5ml capacity. The tank adopts innovative 3 layer liquid guiding system combining flax paper and cotton that works together to ensure pure flavor outputs and no dry hits. The fibre in the paper actually expands over time, which means that the flavor production actually increases the longer you vape it. This innovative coil head also has a higher burning point that traditional cotton-only setups, meaning that dry hits are minimized overall. This impressive atomizer is designed to be very user-friendly and promises to deliver an optimal vaping experience for a wide range of users.This item also has many color to choose.